Goodness, the weeks are flying by! Here we are at Perfect Picture Book Friday again already! Having spent half my week washing the dogs I am feeling a bit behind (see Wednesday’s post if you missed it and are wondering why). The result? I will be admirably succinct! Links To Resources: Dragon coloring pages, printables and crafts, dream catcher craft for kids (not exactly fear of the dark – more nightmares – but same general area :)), talk about fears with kids – what are they afraid of? what are some things they could do to scare those fears away? Why I Like This Book: This is a sweet story told and illustrated in a comforting way. Alexander’s parents are kind and understanding, but they leave it up to him to face his fear. He does, learning a valuable lesson in the process: if he is brave enough to face a dragon, he can handle the dark. What’s great about this book is that, should you happen to be reading it to several children at once (for example, your own at bedtime :)), it’s a soothing story for one who is afraid of the dark while still a fun story about a boy and a dragon for everyone else. Now, everyone, off you go to enjoy all the other books on today’s list. I told you I was going to be admirably succinct! (And yes, it’s really me, not an impostor :)) I was going to wax poetic about something I want to share with you, but it will have to wait until I have time to do it justice… maybe Monday 🙂 Also, keep a weather eye out for the upcoming Halloweensie Contest Announcement!!! PPBF bloggers, please leave your post-specific link in the list below. We've been having fear of the dark issues while traveling. We may need to look this one up at the library. Have a great weekend. Ah, the weather is a changing. He “dons his armor …” LOVE it! I'll never have enough books about tackling fears on my shelf. What a sweet book, Susanna. I love the “oldies”! Sorry about your dog. You won't believe this, but I've always thought skunk scent (from road kill) smells like roasted coffee. My family thinks I'm crazy! I love that thought, “If he is brave enough to face a dragon . . .” I also like the dad in this book. Definitely worth checking out. Thanks! This sure looks like a cute one. I like to hear about kids conquering their fears. Alexander's Dad sounds like a pretty cool dad! What a cute story! Love to know how he solved his fear. I am still away, just arrived in Cairns for the wedding tomorrow, 30degC at 8pm right now and managed to borrow a computor for a couple of hours. Yay! Thanks for reminding us of this book, Susanna. Not only for the kids but for those of us (yeah, I admit it) that have to restrain those helicopter parenting urges. Kids can do a lot on their own. I once wrote a manuscript with this very issue only it was monsters and once I found out how many books there were dealing with this issue I didn't pursue publication. I think one of the ways parents can help their kids be less afraid of the dark is by making friends with their fears or what they are afraid of. It's psychologically sound. There fore this book is a valuable tool to that end. Whew! Can I get off my soap box now? I will have to check this book out. It sounds like a perfect picture book. So many kids are afraid of the dark and I like the idea of a dragon under the bed and the child's solving the problem himself. For a while I was able to go to blogger and sign in on your blog as a guest without having to go to Firefox. But, all this week Disqus isn't downloading at all for me when I bring up your site. So used Firefox to respond to your PPB. Don't know why. Still could respond to all of the links this am on blogspot. I can't believe that I've never heard of this one before. I'm gonna check it out. And I await your Halloweensie instructions with bated breath. Ooh! Have a lovely time at the wedding, Diane!!! ACK! I don't know, Pat! Disqus has been weird this week – duplicating comments and the like. And my web mastermind has been working on my blog today to try to fix the tabs, so maybe that had something to do with it… So sorry for the inconvenience… again! I haven't heard of this book before…but I have a wonderful feeling my Kindergarten students would LOVE it! My library doesn't have it available 😦 That's so unusual. They normally have the books I want unless they're really new. What a nice offer, Susanna. But if something happened to it, that would be awful. I found it used on Amazon for a reasonable price. I'm sure it's less than what it would cost to ship it forth and back. I added it to my wish list. My wish list grows and grows 🙂 Thanks for offering, though. 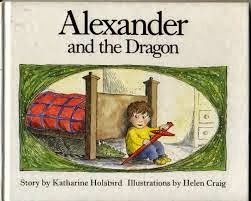 This was my 25 year old sons favourite book as a child. I use it regularly in class with my 10 year olds and this year it is forming the basis for our class assembly. Many years of enjoyment still to be had and I, too, love the last picture!.